This is a new generator. You may select this generator in More World Options when creating world. In this generator, the world is made up of massive spheres with glass domes. 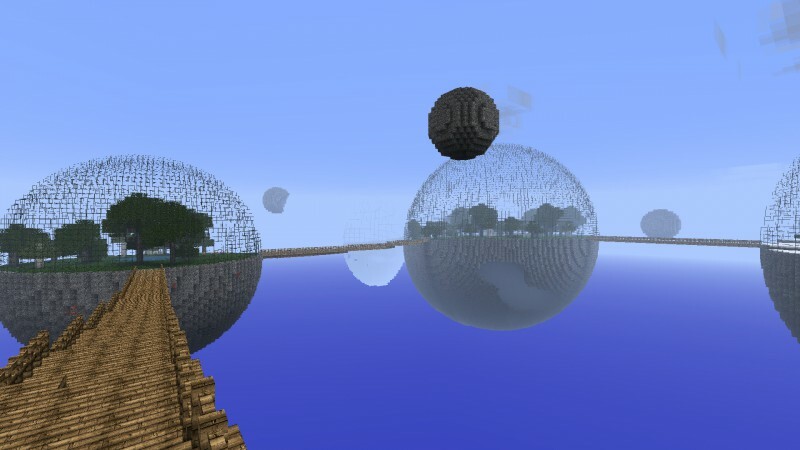 Inside these spheres are random biomes. There is a random chance of a lake being placed in the center of each sphere. Usually water, but rarely lava. Bordering this lake you will find sand for water, or gravel for lava. Connecting each sphere is a wooden bridge with fence rail. Beside each sphere is a smaller sphere, which is where you will find diamond and lapis lazuli. These ores only occur here, the others are equally spread throughout the spheres. The cave generator used here is a modified Nether cave generator, where like on the surface, will generate lava below a certain level. If this lava reaches the outside, an obsidian wall will be made to hold it in. Many options can be changed in ".minecraft/config/Biosphere.cfg".